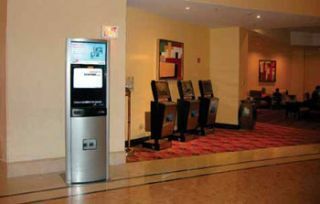 The Send A Message (SAM) kiosk is a multi-purpose digital media kiosk that provides hospitality properties with a powerful tool that delivers a unique set of services while providing several revenue opportunities. SAM’s easy to use personal media workstation allows users to quickly upload photos from their digital cameras, create customized postcards, and print them on high-quality photo paper. In addition, they can directly access Fujifilm’s “See Here” photo website for uploading their pictures for online storage or creating photo gifts that can be ordered directly from the kiosk. Revenue is generated from the kiosk through the sale of on-screen ad space and by charging users a fee for creating their customized postcards. All of the functionality of the kiosk can be managed remotely through Omnivex digital signage software. Fujifilm North America installs and maintains these units for Send A Message, Inc.
Digisplay, LLC is a technical integration firm, offering visual communication solutions that include developing software for interactive displays, LED billboards and LCD, plasma and LED display systems.